After initial hostilities and threats to my person, traditional mead makers seem to have accepted my presence in their midst, and I have come to see the interplay of their dominance battles within the tribe and the constant quest for honey and authenticity with the detachment of a rational anthropologist. I can only hope to retain the trust of these gentle, beautiful creatures in the future. 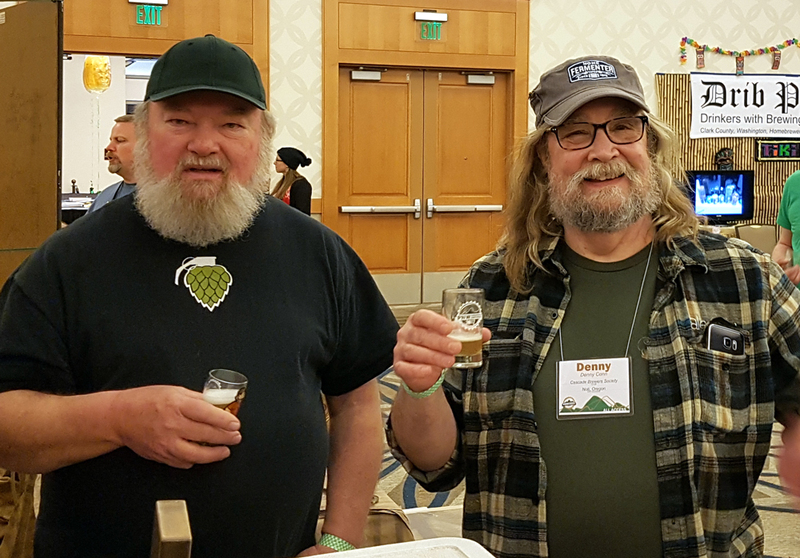 It’s held in Vancouver Washington, which is immediately north of Portland Oregon, where most of the brewing clubs and a lot of the brewing action in the Pacific Northwest happens. 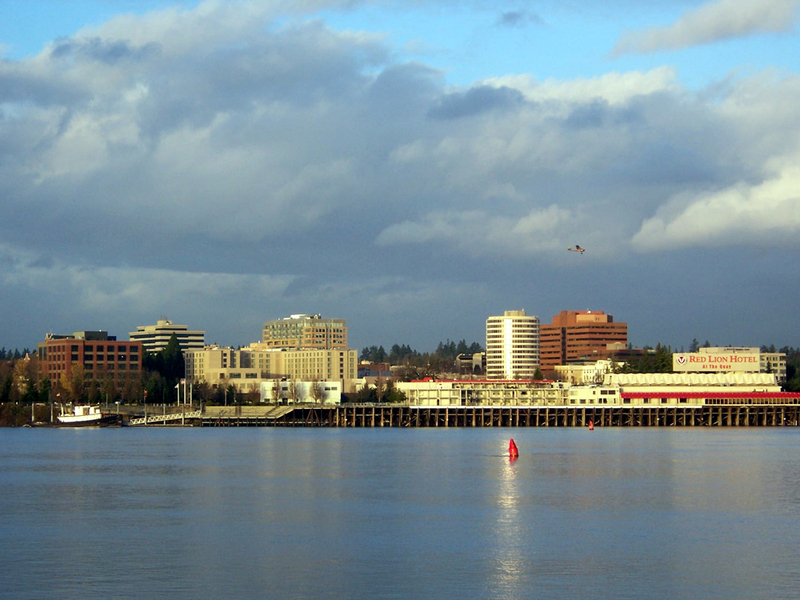 Why hold it in Washington if Portland is so darn awesome? Money: doing it in Portland would probably double costs as with popularity comes great price tags. Still, although Vancouver is a tiny little burg it’s not a bad place at all. Best of all it’s only about a 5-1/2 hour drive from Chaos Manor, just over the border from Washington in Canada. With a car full of jockey boxes, CO2 apparatus, kegs and bottles, I wedged a suitcase and a spouse in there for the journey. 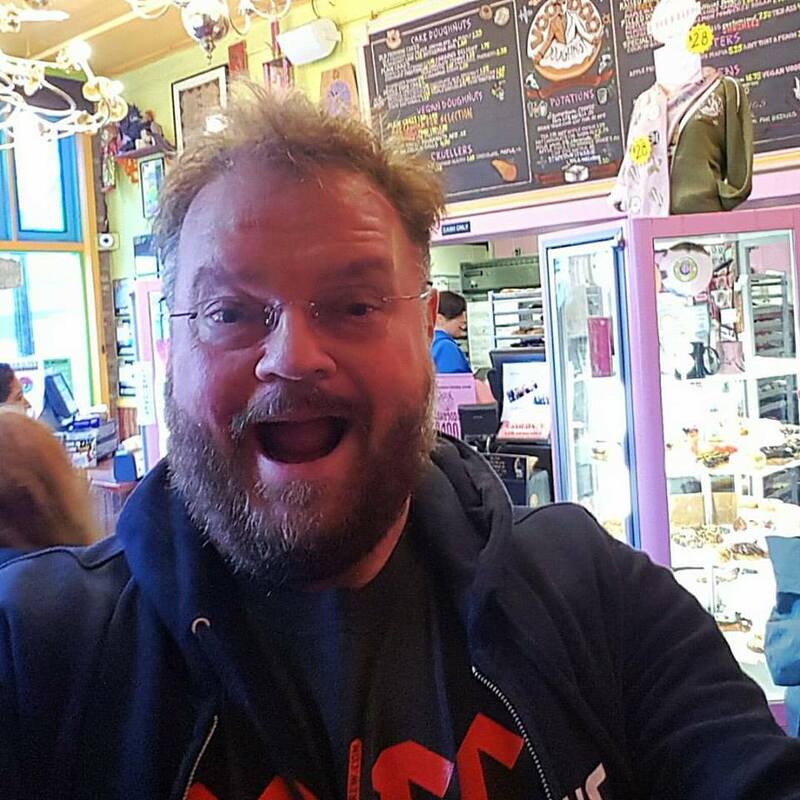 Portland is not without its charms, and I killed a couple of days hitting Voodoo donuts, parks, museums and shopping. I was also lucky enough to have time for my friends Emily and JT, a delightful couple of Oregonians who not only make great beer, but are also cool in many other ways. That’s pretty much the best part of working in the industry I’m in: you meet so many wonderful, gracious and lovely people, and long after businesses are gone and deals are done, they’re the ones you remember. 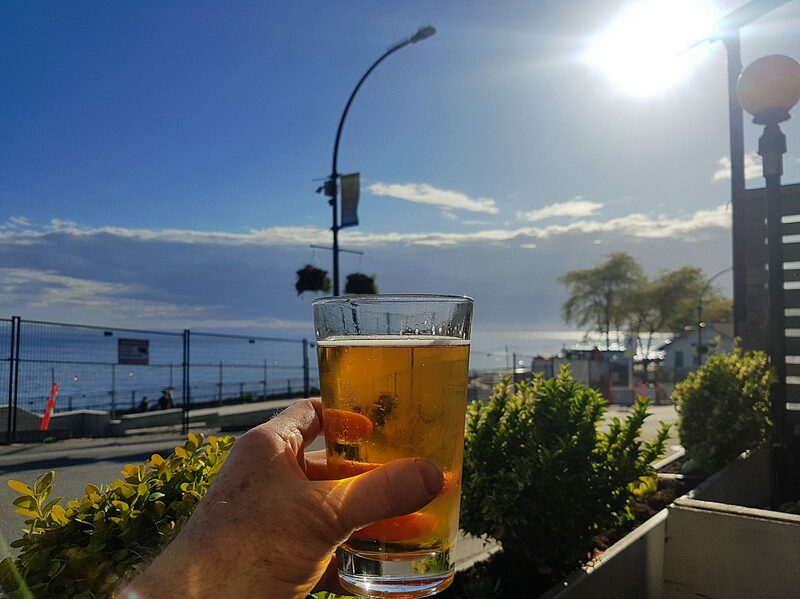 Eventually I had to put the beer down and go to work. The seminar was a success, with a couple of dozen folks listening to my lecture (you can check out a copy of my presentation here), enjoying Ancient Fire Mead and my own creations. Everyone agreed that Ancient Fire‘s meads (generously donated, if you recall, by Jason and Margot Phelps) were superior examples of the craft, while my bone-standard traditional mead was (generously) described as ‘icky’. The Barkshack was very well-received, with some participants asking for thirds, a very gratifying circumstance. I had a lot of really great questions from the crowd, who were keen to make their own mead, authentic and drinkable. While I’m only a winemaker trying to understand all kind of fermentation, I hope my message that mead–heck, any fermented beverage, for that matter–doesn’t exist in a vacuum on it’s own, but needs to be seen as part of the family of fermented drinks that we can all share, whether it’s dandelion wine, Russian Imperial Stout, or Cabernet Sauvignon. Tradition is great, because it teaches us where we come from and how we got to where we are, but it’s innovation and sharing ideas that will take us where we’re going next. After the lecture was done, it was time for club night. If you’ve never been to a brewing conference club night, you’re really missing out. 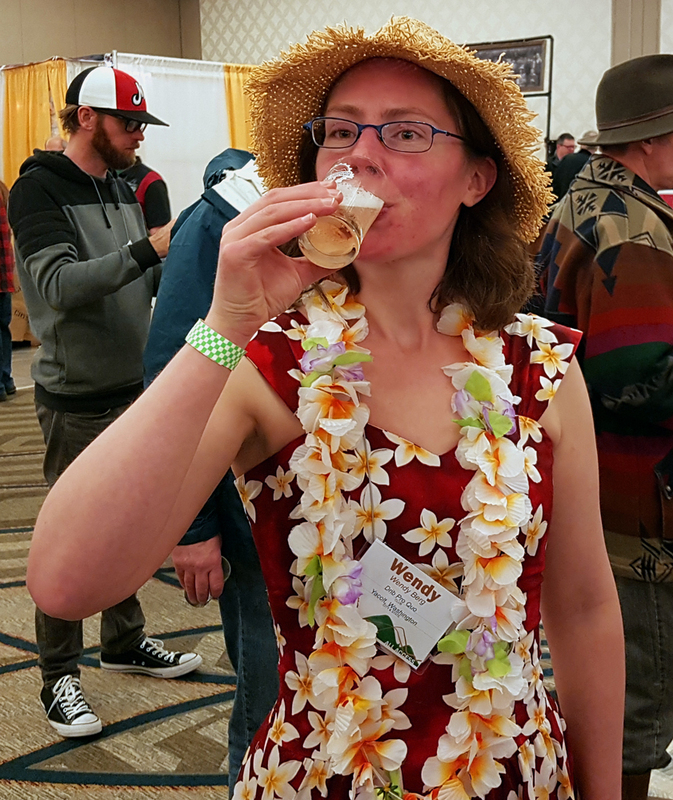 If you’ve been to the one at BrewCon (I was there the last time it was in San Diego) it’s a glorious riot of beer craziness. PNWHC club night is smaller, but they go all-out crazy with beautifully decorated booth, some of which are more like small brewpubs than little club gatherings. 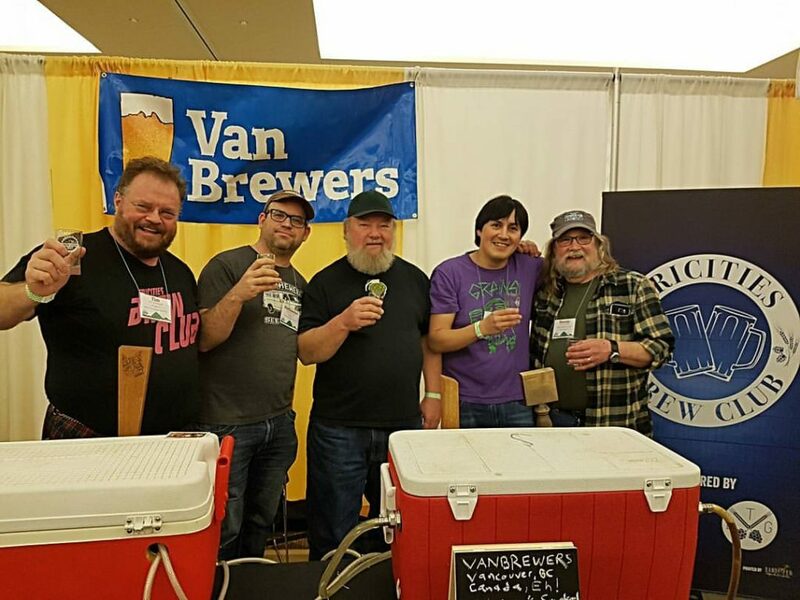 Tim, Alvaro and Nathaniel, representing Vanbrewers and the Tri-Cities brewing clubs. Seems legit. 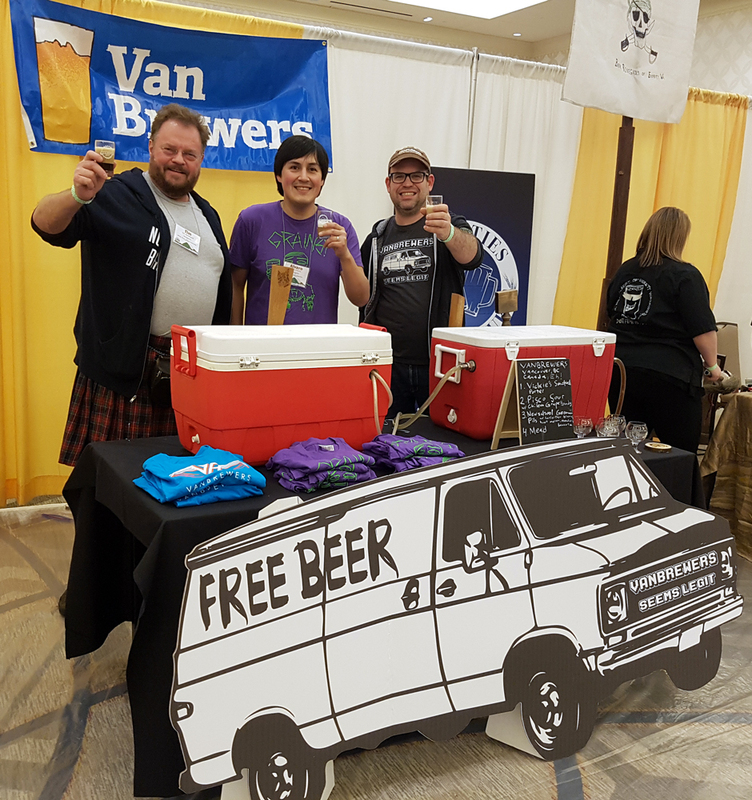 Our own booth was a bit more modest, as it was me straddling the fence for the Tri-Cities Brewing Club and for Vanbrewers, along with Alvaro and Nathaniel. We’d like to make a big show of it, but with the US exchange rate and transportation costs all of us were combining it with business trips or vacation time. We were up 50% in attendance year-over-year, a trend we hope will continue. We were pouring Nathaniel’s Vickie’s Smoked Porter, a really solid porter made with Miss Vickie’s smoked potato chips, Alvaro’s Pisco Sour (I think it was a Saison base, but boy howdy was it delicious) as well as his new world Pilsner with modern German hop varieties, as well as my Barkshack Ginger mead. My own prediction was that while the blockbuster Imperials and Double IPA’s were going to be early favorites with the crowd, the mead, balanced to off-dry, fruity and refreshing, would get more popular as the night progressed. In the spirit of the thing! Glad you enjoyed it, Wendy! Turns out I was right. By the end of the evening most of my keg was gone, with the folks enjoying it coming back for fourths and fifths (not to worry: everything took place in the hotel and nobody was driving anywhere, and there wasn’t anyone overserved–lots of little samples instead). Two very welcome visitors were Denny Conn and Mike McDole, who both tried the Barkshack and appeared to enjoy it. Denny’s comment was that it was the first mead he’d tasted in years, and that he didn’t mind it was the highest praise I could have asked for. After that it was all over but for the packing and tidying and tripping back up to Canada. I’d like to think I learned something on my mead journey, both from making it, teaching people about the history of fermented honey, and the fallout from a tiny minority of mead makers who really took offense at me approaching ‘their’ beverage with humor and cynicism. People love what they love. And we beer geeks, wine dorks and mead maniacs love what we do so passionately that we’re willing to share both our brews and our knowledge with others, so they can catch the bug and make it a part of their lives–or at least so they can understand something we consider amazing and wonderful. That’s a thing worth investing your time, your passion and your self-identity into. And I’ll drink to that. If you’ve just tuned in, be sure to read Making Mad Mead Part One and Part Two. As we return to our story, I am still a persona non grata with certain elements of the mead making subculture. Still, it’s nice to get mail from angry strangers, even if they can’t spell ‘nincompoop’. Part three logically would be about processing my fermented Barkshack Ginger Mead. But first, a dark confession: I had already made a batch of mead, well before the delicious pink juice you saw in part one and two . . . I was counting on my pal Jason to supply the attendees with great examples of well-made, modern mead done with the sensibility of someone who had a background both in wine and beer making, and who was good enough to sell mead commercially. He came through in a big way, with a generous shipment of his excellent meads. 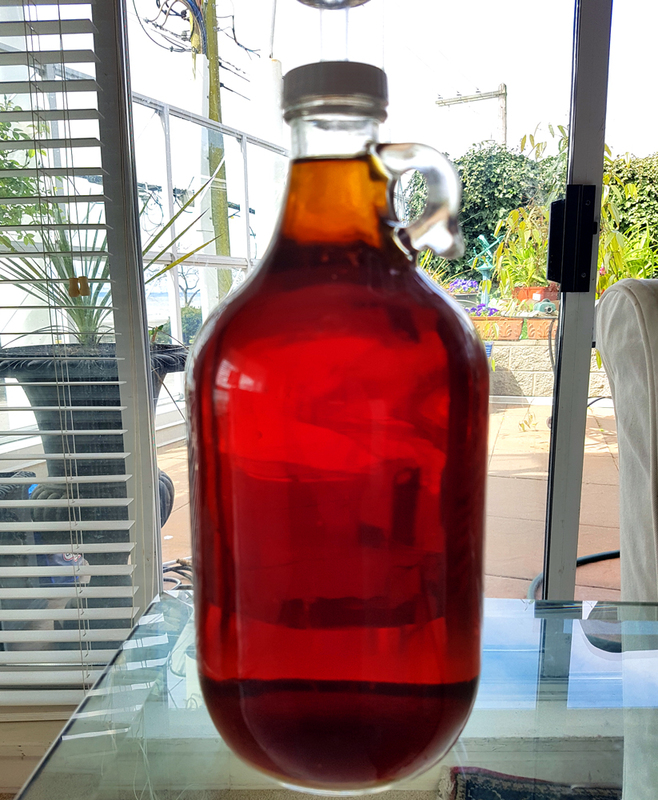 I had commercial mead, I had my disruptive interpretation, and I also had a dark secret: I had already made an authentic prehistoric mead (sort of). A couple of years ago I went on a hike in the Mayan jungles. After many amusing misadventures, including falling down a cenote and losing a car, I came across a little rural stand, way off the beaten path, that was selling honey. The folks in charge had only a modicum of English, so one of their kids explained to me that they gathered honey from wild hives in the jungle and sold it to tourists. They also traded it to folks in Oaxaca for coffee beans, which they roasted over wood fires–they made me the best cup of coffee I’ve ever had in my life. I brought that bottle of honey home and tucked it into the cupboard, mainly as a curiosity: it was dark as the Coca-Cola that had previously occupied the bottle it came in, with a deeply aromatic caramel note and quite a lot of detritus from being an unfiltered product, as well as being unpasteurized unregulated and untouched by modern methodology. One day, however, I decided it was time to confront mead on its own turf, and formulated a plan to replicate the ancient ways. What can I say? 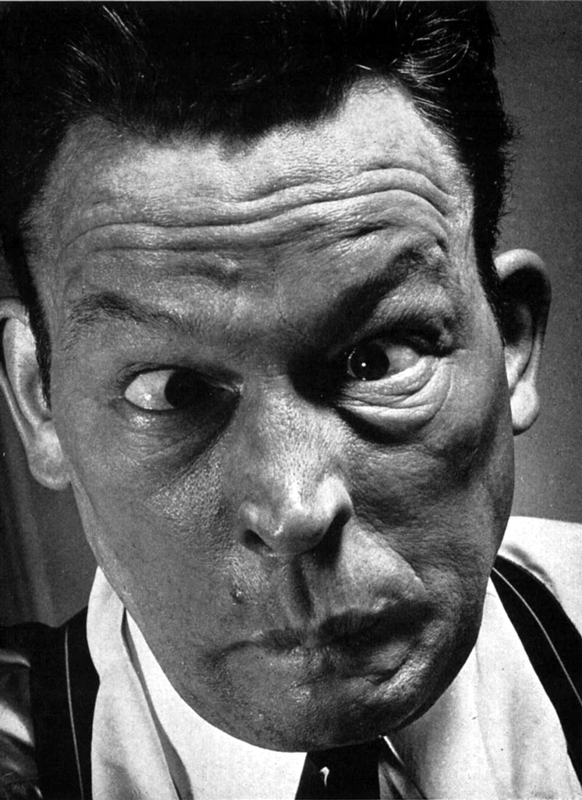 It’s my attention surplus disorder leading me down every possible path. By itself my Mayan honey wouldn’t be enough to make a satisfactory gallon of mead. 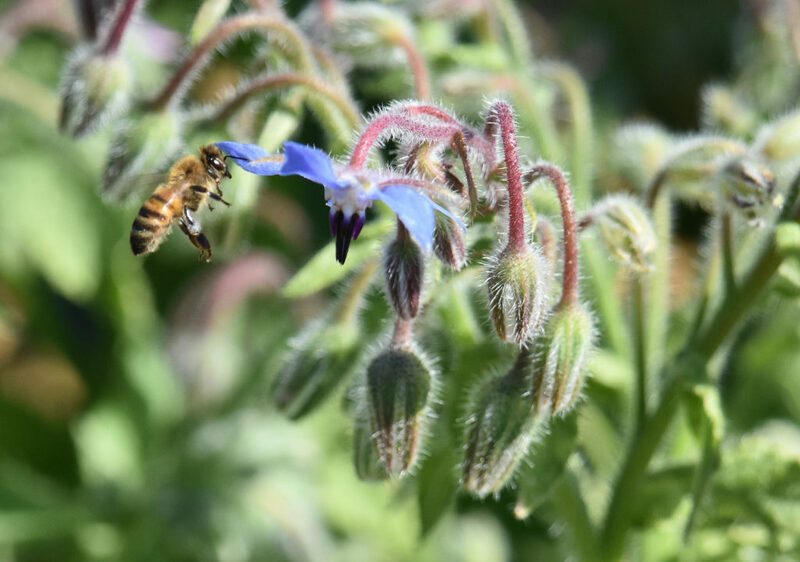 Fortunately, I had a little bit more honey around that fit the bill. The first was a jar of Cuban honey (relax, I’m Canadian, we can trade with them), a gift from a friend. Low-tech processing ensured it was minimally altered from the natural state, although I’m pretty sure it got at least some filtering. There was finally a small dribble of honey from a jar of unpasteurized Elias organic honey that my wife may have used in a dessert without telling me. They’re a producer from Prince George British Columbia that’s got a very good reputation for quality. 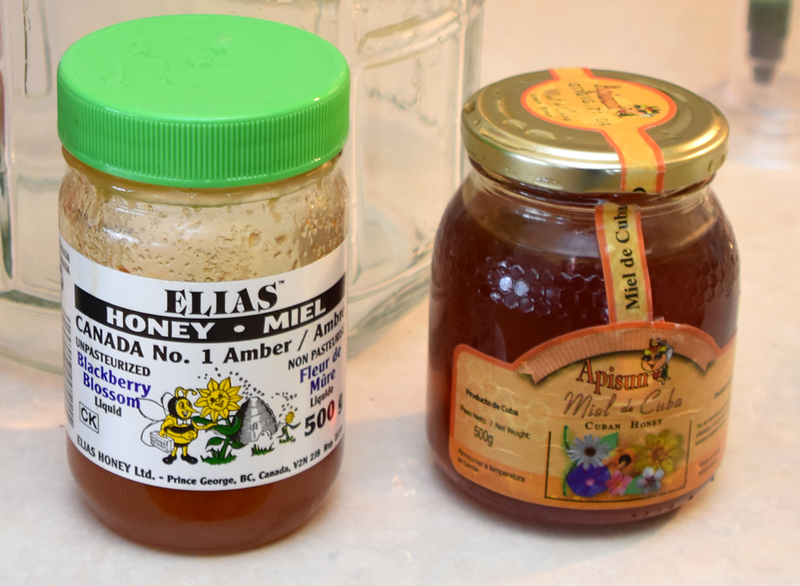 Together all of these honeys fit the bill for an old-style of honey, and would help me make a roughly traditional mead. With just over three pounds of honey, I was ready to make a gallon of mead. I diluted the honeys with half a gallon of 55C/130F water, stirred to thoroughly mix, and cooled it to 24C/75F, then topped up with dechlorinated water to 4 litres/one gallon. Predicted SG on this would be around 1.100, so if it fermented completely dry it would make around 13-14% ABV. In keeping with primitive methods I didn’t bother with a hydrometer reading. If it was off there was no way to correct it in any case: I had no more honey suitable for the recipe. I chose to add yeast nutrient and a commercial yeast strain, because I wanted to give the fermentation a fighting chance. I used Fermaid K and Lalvin EC1118 Champagne yeast. If you’ve never used EC 1118, it’s . . . it’s kind of like the Incredible Hulk of yeast. It’s the strongest yeast, kills other yeast casually, ferments everything, and tolerates most conditions without producing off flavours. I could have left it outside to get a wild yeast, but we have hummingbirds. I could also have used bread yeast, but if you’re gonna add a commercial culture, you don’t bench the champ. 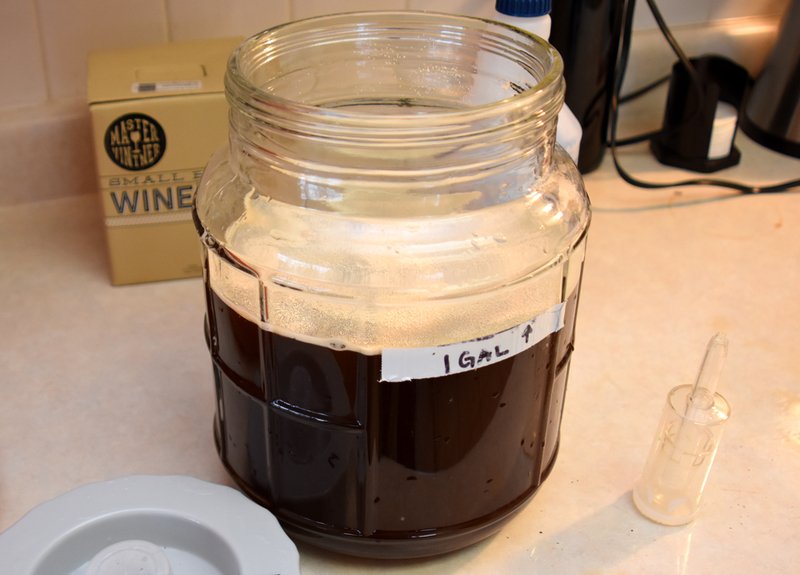 I pitched, fermented at 24C/75F, racked to two half-gallon jugs after four weeks of (very slow) fermentation and tucked it into my cellar to get a couple of months of age. It wound up very nice and clear, and smelled awful, kind of like a combination of raisins and Porta-Potty: not in the enteric bacteria sense, but in the sense that I really wanted to do everything I could to avoid it. When the call came in from the PNWHC to do the seminar, I bottled up half of it and put it aside to age and left the rest under an airlock to do it’s thing for a year or two. We’ll see what it tastes like in 2018. Snapping back in the present, in the next installment well get on with my Barkshack Ginger Mead. Processing that is going to involve fining, sterile filtering, stabilising with sulfite and sorbate, and back-sweetening with inverted sugar, and finally artificially carbonating in a keg with CO2. 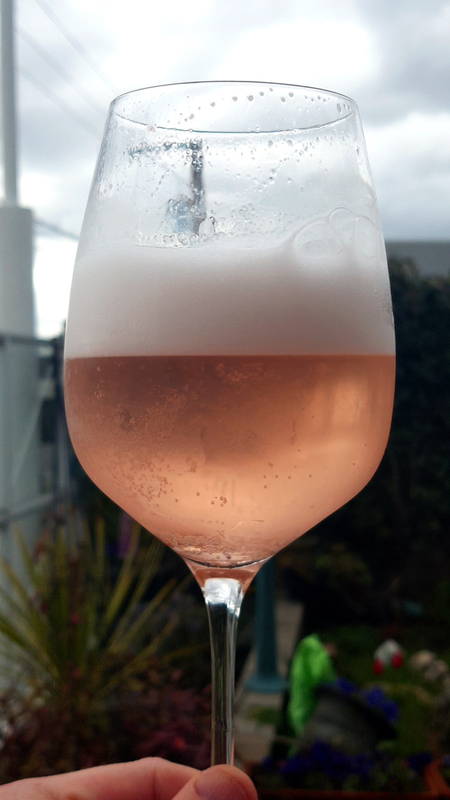 I’m hopeful that further explanations of what I’ve done will help mollify some of the mead makers who were concerned that I was going off half-cocked. I can assure all of them that I’ve never gone off more than one-quarter cocked in my life.